Fats was born in New Orleans and as a small child he learned to play the piano from his brother in law, making his debut at 10 years old. He skipped school in his early teens and having been influenced by Albert Ammons and Fats Waller he began playing piano in New Orleans nightclubs, which is where he met and worked with bandleader Dave Bartholomew. In 1949 Bartholomew took him to the Imperial label to record, within a few months they had their first hit, ‘The Fat Man’ got to No.2 on the R&B chart in early 1950. He followed it with two more top 10 R&B hits and then in 1952 had his first No.1 on the R&B chart with ‘Goin’ Home’. From the remainder of the 1950s he was rarely off the R&B chart, having top 3 records with, ‘Going To The River’ (1953), ‘Please Don’t Leave Me’ (1953) and ‘Ain’t It A Shame’ (1955). It was ‘Ain’t It A Shame’ that crossed over to the Pop chart making No.10 and introduced Domino to a wider audience. Most people think this song is called, “Ain’t That A Shame”, because that is what Fats sings, but on the label it is definitely ‘it’. In May 1955 it entered the R&B charts and ended up spending 11 weeks at No.1. It’s progress on the main Billboard chart was hampered by a cover version by Mr Vanilla, Pat Boone, who took it to No.1. In the UK it became a hit for Fats in early 1957, making No.23. Fats' success with white audiences was in some ways amazing, because he did it without radically changing his musical style, a style that owed a great deal to the big band sound of New Orleans, honking saxes and a driving beat. Interestingly, Fats learned to speak English after he first learned to speak French and you can hear his accent coming through if you listen hard to some of the early recordings. In 1956 ‘I’m in Love Again’ made No.3 on the main chart having also topped the R&B chart. His next major hit was ‘Blueberry Hill’ written by Bobby Cerdeira, Al Lewis and Larry Stock. 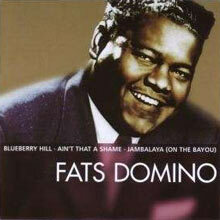 ‘Blueberry Hill’ is quintessential Fats! Quintessential rock ‘n’ roll, but originally it was a hit for Glenn Miller with a vocal by Ray Eberle. If a record says hit from its opening notes it’s this. It made No.6 in the UK chart and in the process became the biggest of his twenty British hits; it also charted again in Britain in 1976. It was also covered by Elvis, Rick Nelson, Andy Williams and in 1976 by the Beach Boys. His next hit in early 1957, ‘Blue Monday’, was from the Jayne Mansfield film The Girl Can’t Help It, was an R&B No.1 and got to No.5 on the main chart; it could only manage a more lowly No.23 in Britain. In 1957 ‘I’m Walkin’ was another R&B No.1, a Billboard No.4 and a UK No.19, Valley of Tears an R&B No.2, a No.8 on Billboard and UK No.25. In the US there were another six more lowly placed singles on the main chart, It was 1959 before Fats had another major US hit, ‘Whole Lotta Loving’ got to No.2 on the R&B chart in November and No.6 on the Hot 100. “I want To Walk You Home’ in 1959 along with ‘Be My Guest and ‘Walking to New Orleans’ in 1960 became the last of Fats’ recordings to make the Top 10 of the Billboard chart., although he still charted another 27 times before the decade was out. 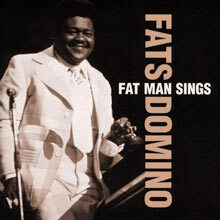 Domino’s last US chart entry was in 1968 when his cover of the Beatles ‘Lady Madonna’ spent 2 weeks on the Hot 100 at No.100. The irony being that Paul McCartney based his song on Fats’ playing style. Perhaps it was fitting that this should be his last hit. 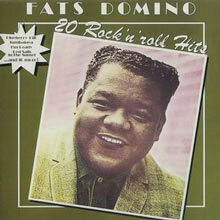 There is absolutely no denying that Domino was one of THE rock ‘n’ roll names of the 1950s – second only to Elvis. He later turned to playing Las Vegas as well as touring in Britain regularly. In 1980 he even managed a hit on the country chart, ‘Whiskey Heaven’, from the Clint Eastwood movie Any Which Way You Can got to No.51. Of his 66 records that made the Billboard chart, Fats wrote 48 of them, many of them with Dave Bartholomew. Besides being loyal to Bartholomew, Fats was loyal to his home city and lived in New Orleans for almost all his life. In 1986 he was inducted into the very first Rock and Roll Hall of Fame, the following year he won Grammy’s Hall of Fame and a Lifetime Achievement Award. He lived in a brightly painted yellow mansion in the predominantly working-class Lower 9th Ward, where he was often to be seen in his bright pink Cadillac. In 2004, Rolling Stone placed him at No.25 on their list of the "100 Greatest Artists of All Time." In 2005 with Hurricane Katrina approaching New Orleans, Fats chose to stay at home with his family, partly because of his wife's poor health. His house was in an area that was heavily flooded; by January 2006, work was underway to repair his home. In August 2006 George W. Bush visited Fats in the Lower 9th Ward to give him a replacement of the National Medal Of Arts; the original having been lost during Hurricane Katrina. In 2009 Fats made a rare appearance at The Domino Effect in the New Orleans Arena in a show that was a tribute to New Orleans’ greatest ever artist, The man who had sold 65 million records was honored by B.B. King, Chuck Berry, Little Richard, Keb’ Mo’, Wyclef Jean, and Taj Mahal. Fats was a one-off in an industry full of artists who are ‘likes’ and his music as well as inspiring many other performers has given immense pleasure. 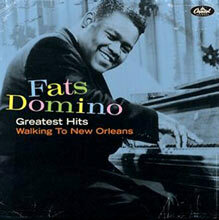 Following Capitol/EMI's last Fats Domino CD compilation (Fats Domino Jukebox: 20 Greatest Hits the Way You Originally Heard Them) by five years, 2007's Greatest Hits: Walking to New Orleans betters that comp in terms of sheer numbers (as it does 1990s My Blue Heaven) by ten tracks and this is a case when more is indeed more. Ten tracks is enough to offer depth, particularly in his earliest sides but also with a couple lesser-known hits from his rock & roll prime, turning this into a joyous overview of one of the greatest musicians of the '50s. It's nice to have this hit the pre-rock & roll and R&B a bit harder -- "Ain't That a Shame" doesn't roll around 'til track six, then it's another ten before "Blueberry Hill" kicks off the string of crossovers -- because it illustrates how hard this rocker, who often gets pigeonholed as merely a genial piano player, really rocked. And though he cut other great material during his Imperial Records stint, it is surely one of the most consistent bodies of work in rock & roll/R&B, heard to full effect either in the four-disc Walking to New Orleans or the complete Bear Family box: for those who don't want or need to delve that deeply, or are just beginning to explore, this is nothing less than essential. The final volume -- by catalog number -- of The Right Stuff's Blues Kingpins series belongs to the incomparable New Orleans rock & roll and boogie-blues king Fats Domino. These collections are, for the price, simply the finest money can buy in that they include tracks that may have been overlooked but are at least as necessary to an artist's oeuvre as her or his hits. In other words, the Blues Kingpins series is for connoisseurs, thank God. Fine mastering, aesthetically pleasing packaging, an excellent track selection, and a wonderful set of biographical and critical liner notes accompany each volume. 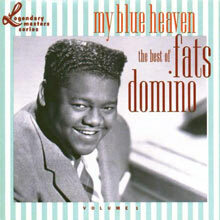 This set of 18 tracks is Fats Domino for those who want something besides "Blueberry Hill." While that track can be gotten anywhere, along with "Walking to New Orleans," "Ain't That a Shame," and "I'm Walking," these can't. And no, none of those cuts are included here. This is a volume of Fats Domino playing the blues New Orleans style with his amazing voice at the center of killer lyrics and a funky, jump blues piano stroll with a second-line rhythm accompanying most. The material here has its origins in 1949 on the Imperial label and begins with "Hide Away Blues," a full year before he would cap the R&B charts with "The Fat Man," which is also absent from this collection, thank God. What else is here is Domino's amazing run of sides that go up to "Ain't That a Shame" in 1955. Here are smoking versions of "Please Don't Leave Me," "Boogie Woogie Baby," "How Long," "Trust in Me," "So Long," "Domino Stomp," and many others, with killer New Orleans backing bands led by Dave Bartholomew and others. These six years in Domino's career laid the foundation for the pop star who did not change his style substantially for white teen audiences in the idle to late '50s. His sound was a bit grittier in the early days and a little less persona-driven, but Fats played the jump blues and boogie-blues like a madman with great grace and a singular style, making this one of the great treasures of recent blues reissues at any price. 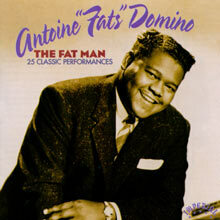 Released in conjunction in 2002 with the four-disc box set Walking to New Orleans, as well as three other titles in EMI/Capitol's Crescent City Soul series, The Fats Domino Jukebox: 20 Greatest Hits the Way You Originally Heard Them becomes the definitive single-disc Fats collection on the market nearly by default -- it's remastered, it's the one in print, and it has a flawless selection of songs. It's not markedly better than, say, the '90s' definitive Fats compilation, My Blue Heaven, since it has essentially the same track selection and even if the tapes were restored to their originally running speed, the difference is not enough for most ears to notice, but it's still a great collection of some of the greatest music of its time, and it summarizes Domino's peaks excellently. 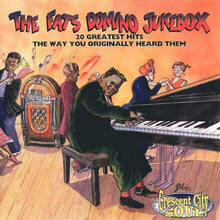 So, if you don't already have a Fats Domino collection, this surely is the one to get (despite the really ugly art). 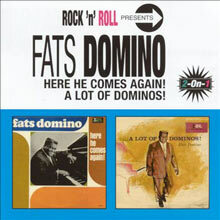 This two-fer from EMI features a pair of out of print Fats Domino LPs: Here He Comes Again (1963) and A Lot of Dominos (1960), both originally issued on Imperial. Highlights among the 24 tracks include "My Girl Josephine," "Walking to New Orleans," and "Lil' Liza Jane." 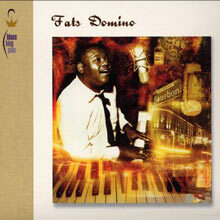 These sessions provide a glimpse of Fats mixing pop and country arrangements into his New Orleans R&B gumbo. There are so many of Fats' collections out there that it's hard to pick a true "best" out of the bunch, but this one is certainly a top runner! With TWENTY of his top hits, you'll definitely find something for everyone on here. Released in 2003, 20 tracks. 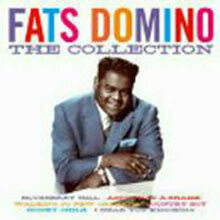 For the budget-minded fan, this 20-track single-disc compilation of Fats Domino's Imperial smashes will serve nicely. Not much of his early pre-rock stuff -- "The Fat Man" and "Please Don't Leave Me" are all that are here -- but there's plenty of his hit-laden output from 1955 on -- "Ain't It a Shame," "Blue Monday," "I'm in Love Again," "Blueberry Hill," "I'm Ready," among others. One small but substantial difference between this set and the larger packages: It uses non-sped-up masters of his mid-'50s material (some of his hits from this era were mastered slightly faster than true pitch). Even if they're not historically correct, these versions actually sound better.